Build in a Highball glass filled with ice. Top with 2 oz tonic water, garnish with an orange twist, and add a straw. A few Wednesdays ago, I ventured over to the Blue Room where Chris Danforth was bartending. For a first drink, I asked Chris for the Honey & Thistle from the menu, and he believed that it was one of Matthew Schrage's creations. 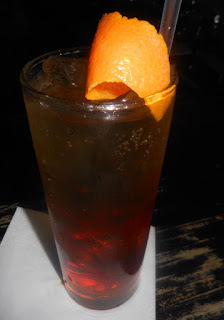 I surmise that the drink's name refers to the honey in the smokey and bitter Amaro Sibilla and the blessed thistle in the Cardamaro, respectively. The orange twist contributed greatly to the Honey & Thistle's nose and prepared the mouth for the refreshingly light, carbonated, and citrussy sip. Next, the swallow was pleasantly herbal, and the quinine from the tonic worked rather well here with the Cocchi Americano and amaros. Chris accidentally made this drink the first time with Cocchi sweet vermouth instead of the Cocchi Americano, and he let me taste the error; while it was still a solid drink with richer grape notes on the sip and swallow, the Cocchi Americano version was indeed the winner.